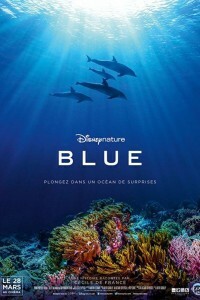 In the big screen documentary movie Blue, originally entitled Dolphins, from DisneyNature, Echo is a youngster who can’t quite decide if it’s time to grow up and take on new responsibilities-or give in to her silly side and just have fun. Dolphin society is tricky, and the coral reef that Echo and his family call home depends on all of its inhabitants to keep it healthy. But Echo has a tough time resisting the many adventures the ocean has to offer.